The Music on the Corner series of live performances in downtown Coos Bay begins July 8. Each Friday at noon there will be live music at the corner of Fourth Street and Anderson Avenue in downtown Coos Bay, sponsored by The World and the Coos Bay Downtown Association. Some of the performers from last year have graciously agreed to return, and some new performers have been added to the line-up. The public is invited to bring a chair, bring a lunch and bring a friend every Friday through Aug. 26. Check with your favorite downtown restaurant; they may have a lunch special available. Opening the 2016 Music on the Corner season are local bluegrass favorites, Kenny, Bob & Rob. The trio consists of Kenny Croes, acoustic guitar and vocals; Bob Shaffar, dobro, fiddle and vocals; and Rob Hamilton, bass and vocals. Next up on July 15 are Finavarra and The Nor’Westers, consisting of Al Rumsch, Bryan Keith, Bruce Swanson, William Mrkvicka and Jon Merten. This acoustic band plays folk music with a blend of Celtic, mingling songs of the sea with some contemporary and traditional folk songs. On July 22, fiddler Rhy Thornton will play alongside Jackie, his wife, who plays accordion and guitar. Al Giardinelli from Bandon and Marshall from Merlin will join Rhy and Jackie to heat things up as The Rogue Rebellion. Big sound on Friday, July 29, will be delivered by the powerful young musicians from Lab Band. Evolution is making its presence known performing professionally and headlining events under the direction of Gary Lebrun. Friday, Aug. 5, will feature Strange Brew, a dance and show band from Reedsport. The band consists of: Jessica Hart, rhythm guitar and vocals; Rebecca Phillips, keyboard and vocals; Sean Grubb, harmonica, percussion and vocals; Rick Colvin, drums and harmonies. The group performs both a cappella and with accompaniment. It’s heating up on Aug. 12 with loop artist Gary Marguson who makes his way to the coast from Roseburg courtesy of the Red Lion Hotel. Marguson has played locally and regionally solo and as an opening act. Returning from last year, Contra Swings, featuring Jennifer Sordyl on fiddle and Don Berg on guitar, will surprise the audience with a mix of Celtic and swing Aug. 19. And finally on Aug. 26, Dale Inskeep will play his mandolin and will be joined by Bill Bartels on guitar. Who knows what kind of surprise Dale will have for the final Music on the Corner event of 2016? 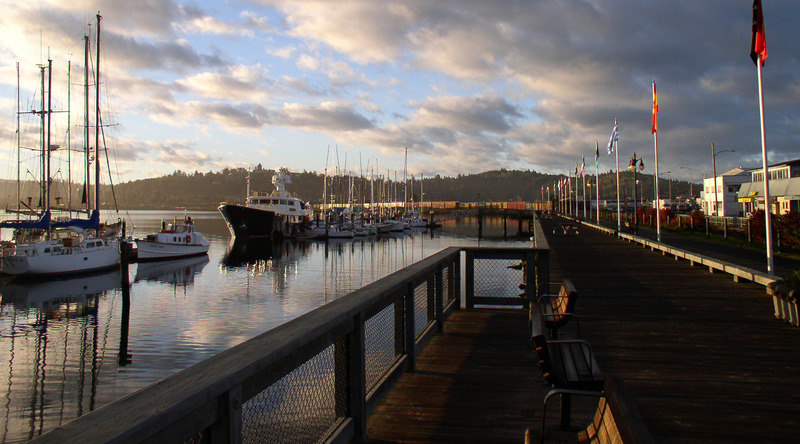 Coos Bay Downtown Association advocates for and supports local businesses to thrive by being a vibrant downtown that promotes healthy living and provides opportunities for our community and guests to shop, eat, mingle and explore. The CBDA is proud to be a part of Main Street America.